Ryman Premier side AFC Hornchurch beat Thurrock 2-1 with two second half goals in a pre-season friendly at Ship Lane. Junior Luke slotted the first on the hour mark, Charlie Stimson’s curling equaliser put Thurrock on terms but Martin Tuohy nicked the winner 11 minutes from time. Hornchurch had the majority of the opening exchanges keeping the ball and made Thurrock chase the ball in the ‘tropical’ conditions. The home side had the first chance seven minutes in as Charlie Stimson’s flick on gave Lamar Reynolds an opportunity to turn his marker, he burst in to the box and his snap shot was turned over by Same Mott. The visitors were awarded a soft penalty 12 minutes in after Rob Gilman brought down Marshall-Katung but George Purcell’s penalty rebounded off the post, which was justice in the Thurrock supporter’s eyes. A ball put down the channel was picked up by work-horse Stimson who put the ball in for Brad Warner but Mott just beat him to it. Captain Lewwis Spence almost put the ‘The Fleet’ in front 37 minutes in as Spence’s free-kick was hit low and hard to Mott’s left post but was equal to it. Hornchurch nearly caught Thurrock napping four minutes in to the second half, as a lofted ball straight down the middle put Purcell in on goal but Andy Walker stayed big and blocked the shot. On the hour mark, Hornchurch grabbed the opener as Junior Luke dribbled past three Thurrock players and slotted the ball into the net. Drinks breaks were needed during each half due to the hot conditions at Ship Lane. Thurrock equalised in the 73rd minute with a great curling shot from 20-yards as Stimson turned, nobody closed him down and put his shot into the top corner. ‘The Urchins’ took the lead in six minutes later as substitute Chris Bourne’s whipped in cross was turned in by substitute Martin Tuohy. Clark almost got an equaliser two minutes from time as his shot just outside the box was tipped over by Mott. This entry was posted in Football, Sport and tagged AFC Hornchurch, Charlie Stimson, Jim Mcfarelane, Junior Luke, Lewwis Spence, Mark Stimson, Martin Tuohy, Thurrock, Thurrock FC. 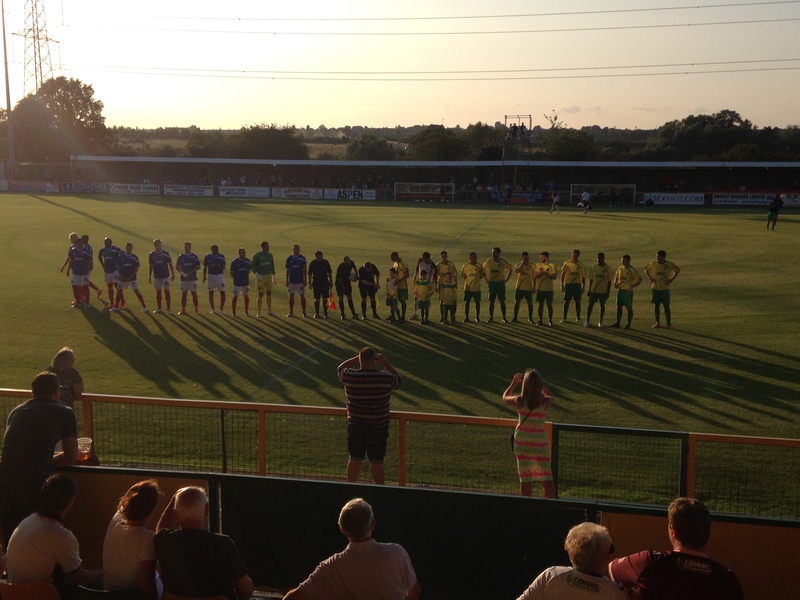 Portsmouth won 2-0 in their third pre-season friendly against Thurrock FC at Ship Lane tonight with two first half goals in their preparations ahead of the fast approaching new season. New signing Craig Westcarr’s brace was enough to see off Ryman North side hosts Thurrock FC at Ship Lane tonight in a 2-0 pre-season friendly. Portsmouth could have converted more chances has they been more clinical mixed with determined defending from the hosts. Portsmouth kept the ball neatly in the opening exchanges and had the first clear chance on the Thurrock goal as Johnny Ertl’s unchallenged header was straight at Andy Walker. Charlie Stimson’s frustration showed early on from chasing down the ball after his reckless challenge on Jack Whatmouth, with only a stern word from the referee. Portsmouth broke the deadlock 33 minutes in as Craig Westcarr was given time to hit a crisp volley on the turn low into the bottom left corner catching out Andy Walker to take the lead. The visitors grabbed a second five minutes later as Westcarr got his second, once again with bags of time to cut inside Lewis Clark and slotted his shot in off the post to double their lead. Although Thurrock had an appeal for a penalty just before the break as Lamar Reynolds was brought down but the referee ignored the appeals. A flurry of changes in the second half as expected for the away side as Ben Close, Andy Barcham and Bradley Tarbuck were introduced. Thurrock made one change in Jordan Clark looking to turn things around for the hosts. Substitute Tarbuck only lasted seven minutes as he was replaced by Rickie Holmes due to injury. The first second half chance came ten minutes in after a superb block by Simon King denied Miles Storey from extending their lead after a well worked move from Portsmouth. Substitute Holmes put the ball on a plate for Wynter from a corner 65 minutes in but mistimed his leap. Holmes again got down the left flank soon after and cut the ball back for substitute Close whose finesse shot bent wide. Holmes for the second time put the ball on a tee for Wynter again whose header down this time bounce wide of the goal. Thurrock almost got a goal back nine minutes from time as Remi Sutton burst into the box but his cutback was blocked and cleared. Close had an open goal to score after Walker’s antics in the corner got the home side in trouble but his shot went wide. Portsmouth’s final opportunity to end on a high came four minutes from time as Barcham’s cross was met by Ryan Bird which bounced off the crossbar and cleared away from danger to deny the third goal. 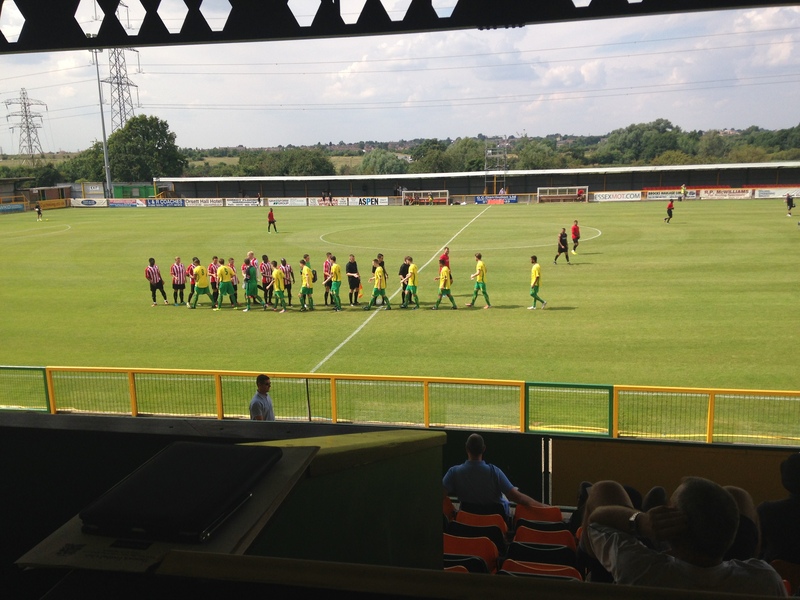 Thurrock play their next pre-season friendly at home to local Ryman Premier side AFC Hornchurch on Saturday. This entry was posted in Football, Sport and tagged Andy Awford, Lewwis Spence, Mark Stimson, Portsmouth FC, Thurrock FC. The Lakeside Hammers grabbed two home points against local rivals Eastbourne Eagles on Friday night with a 47-43 victory. ‘The Hammers’ overturned a six point deficit with five races remaining to win by four points as the stormy weather loomed. Kim Nilsson returned to the side for ‘The Hammers’ in his first home meeting for the claret and blues after the departure of veteran Peter Karlsson as Eastbourne used rider replacement for Mikkel Michelsen. 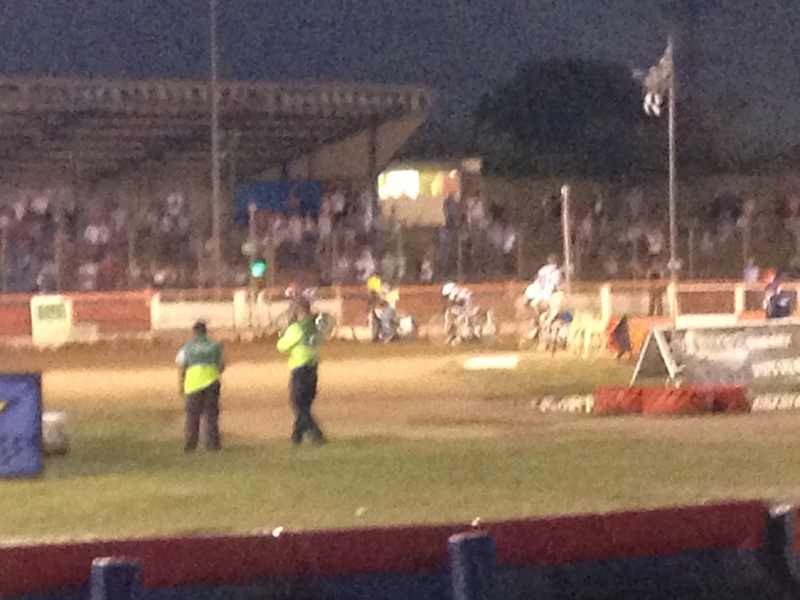 Eastbourne took an early 4-2 lead in the first race after Richard ‘Awesome’ Lawson was excluded for falling. Bjarne Pederson got to the bend first and took the win holding off Davey Watt in second as Timo Lahti was third. Lewis Blackbird won heat two keeping Adam Ellis and Ben Morely at bay to hold their slender lead. The visitors extended their lead as Joonas Kylmakorpi held off Lewis Bridger to extend their gap to 4-11. Kim Nilsson got ‘The Hammers’ first win of the night in race four as Morely struggled to assist him but kept the meeting in the balance. The home side then stepped it up with a 5-1 as captain Davey Watt and guested rider Rory Schlein levelled up the scoreline. Although this was short lived as ‘The Eagles’ rolled of two 5-1 reverses in races six and seven with Timo Lahti aided by Pederson taking the first and Cameron Woodwood followed up by Blackbird to lead 25-17. The hosts fought straight back with their second 5-1 of the night as Bridger won heat eight aided by the fresh Nilsson. The away side stretched their lead to six with a 4-2, Blackbird won once again as Daniel Halsey followed in second. ‘The Hammers’ held on in race ten as the visitors claimed another race win for Pederson (R/R) but stopped Eastbourne from extending their lead with Lawson and Watt in second and third. The comeback began in heat 11, owed to Schlein as he won and Bridger made a pass from the back to second on the third bend on lap one and stood firm for the 5-1 with the deficit at 32-34. Blackbird replaced Halsey in race 12 and after his collision with Lawson brushed himself down and won as he took his third win of the night but ‘Southend Sensation’ Ben Morely and Lawson made second and third. Lakeside went in front for the first time of the evening with a 5-1 as Schlein won another race assisted by Watt as he past Pederson on lap two to lead 40-38. Heat 14 was taken by the visitors as Woodwood won but after Morely replaced Ellis tactically the home side held on to their lead taking second and third. In the penultimate race and as the rain started to fall the skipper stepped up to the plate for ‘The Hammers’ to secure the win and valuable guest Schlein helped in third to take the victory and two precious home league points. Lakeside Hammers had an away fixture at Leicester Lions which was postponed due to bad weather on Saturday and will go on their travels again tonight at Wolverhampton Wolves. Action at the Lakeside Arena will continue next Friday in the form of a challenge match as Essex play Kent featuring Ben Morely and Adam Ellis from ‘The Hammers’. This entry was posted in Speedway, Sport and tagged Davey Watt, Eastbourne, Eastbourne Eagles, Elite League, Lakeside Hammers, Lewis Bridger, Richard ‘Awesome’ Lawson, Rory Schlein, Speedway.